Resolution: Sharing Experience, Building Solidarity! The General Meeting of EPSU CJ has defined the orientations of the union for the next period (read its Resolution). It further approved its accounts. Members’ subscriptions – which guarantee independence – amounted to € 23 675,98. Click on the picture to see how expenses are broken down. 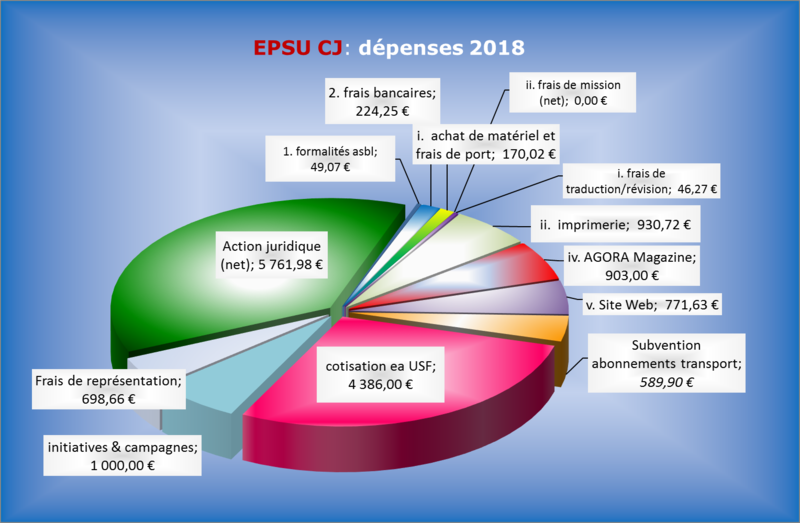 http://epsu-cj.lu/wp-content/uploads/2018/05/logo_usf_epsu_cj_PNG.png 0 0 epsu-cj http://epsu-cj.lu/wp-content/uploads/2018/05/logo_usf_epsu_cj_PNG.png epsu-cj2019-04-01 10:24:212019-04-01 10:24:52Resolution: Sharing Experience, Building Solidarity! Will the process of disintegrating (see Brexit) or an ‘à la carte’ Europe approach be pursued and aggravated or will we build a more democratic, more open Europe, with more solidarity and more convergence towards social progress? It is true that the cost of living in Luxembourg is by 15 to 16% higher than in Brussels. But the only way to remedy this anomaly is to modify the Staff Regulations: a high-risk operation. We believe that before taking a position, everybody must be fully informed. The update taking effect on 1 July 2018 is +1.7%. You may find here some explanations on how this figure was calculated. You can also find the updated salary grids for officials and temporary staff and for contract staff (see comparison with Luxembourg minimum social wage as from 1-1-2019 and pay supplement (in FR)). EPSU -CJ provides € 50 per year subsidy to its members who subscribe to the M- Pass or to other season-tickets.